Workers unearth barrels at the Kadena Air Base, January 2014. 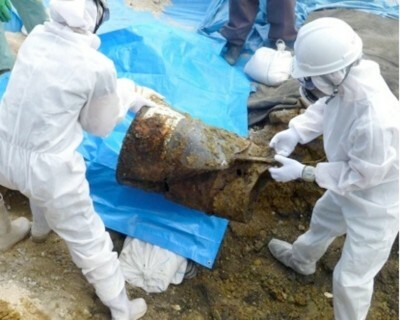 More than six months after dozens of rusty chemical barrels were unearthed from former U.S. military land in Okinawa City, their contents have been identified – and they appear to offer conclusive proof that the toxic Vietnam War defoliant Agent Orange was buried on the island. Announced in early July, the results of two separate studies – one conducted by Okinawa City and one by the Okinawa Defense Bureau – both detected the three signature components of Agent Orange: the herbicides 2,4,5-T and 2,4-D as well as highly-toxic TCDD dioxin.This is the first time that all three ingredients have been discovered on ex-Pentagon property on Okinawa. About half of the 61 barrels also bore markings from the Dow Chemical Company – one of the largest manufacturers of Agent Orange for the U.S. military. The Pentagon denies that Agent Orange was ever present on Okinawa despite testimony from more than 250 U.S. veterans who claim they were sickened by the defoliant on the island during the Vietnam War era.3 A 1971 U.S. government report on Agent Orange cites the presence of a herbicide stockpile at Kadena; the site where the 61 barrels were buried was part of Kadena Air Base, one of the Pentagon’s primary transport hubs for the Vietnam War, until restored to civilian usage in 1987. According to the data released by Okinawa City, all 61 barrels contained traces of dioxin and standing water near the barrels showed dioxin at levels 64 times the environmental standard. However dioxin readings from the soil were below maximum permitted limits and there was no evidence of contamination of the water table. Twenty of the barrels also contained traces of toxic polychlorinated biphenyls (PCBs). Contacted in July for comment on the test results, USFJ director of public affairs, Lt Col. David Honchul, stated that the U.S. military had not yet received the surveys. Last year more than 20 other barrels were unearthed from the same area. Those barrels also contained high levels of dioxin – causing concerns among U.S. parents whose children attend two on-base schools adjacent to the dumpsite. In response to their demands, Kadena officials conducted surface soil samples of the school playing fields and concluded that they posed no risk to human health. However, the new findings reignited parents’ worries. “In light of the latest test results, I hope Kadena officials might be willing to acknowledge that base and local residents’ concerns about potential exposure (both past and present) to dangerous chemicals are legitimate. We want to know if they are now going to change their stance and do something that will give residents a greater reassurance of their safety,” said Jannine Myers, whose child until recently attended one of the on-base schools. At a town hall meeting held on Kadena Air Base in January, 18th Wing Commander Brig. Gen. James Hecker reassured parents that he would do all he could to protect the safety of military families and he pledged to be more forthcoming with information. However the USFJ have hampered subsequent attempts under the Freedom of Information Act to obtain the documents upon which he – and USFJ spokesperson Honchul – based statements related to prior usage of the land where the barrels were unearthed. The burial of surplus chemicals – including Agent Orange – was standard operating procedure for the U.S. military on Okinawa according to veterans. Large caches of barrels suspected to have been defoliants were uncovered on MCAS Futenma in 1981 and on former military land in Chatan in 2002.8 In neither case were tests for Agent Orange conducted. 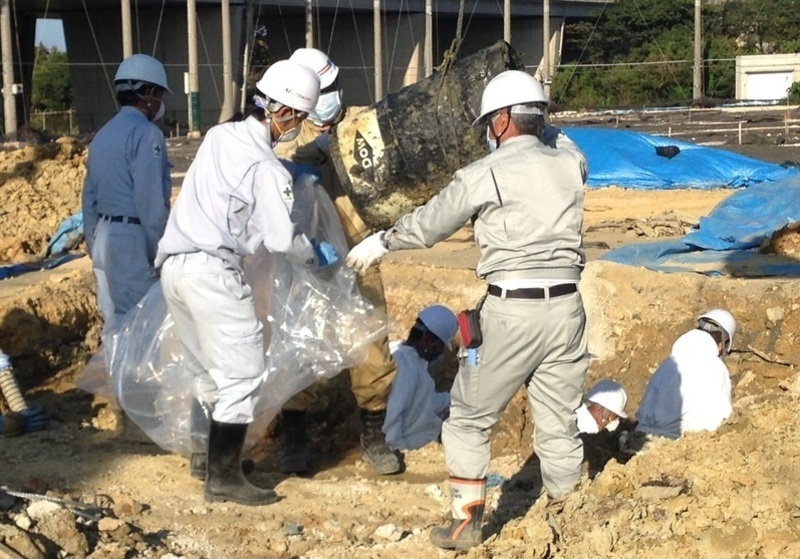 Now Japanese authorities plan to widen the scale of excavation work in Okinawa City to determine whether any other barrels are buried in the area. This is a revised and expanded version of an article that appeared in the Japan Times. Jon Mitchell is a visiting researcher at the International Peace Research Institute of Meiji Gakuin University, Tokyo and an Asia-Pacific Journal associate. In 2012, “Defoliated Island: Agent Orange, Okinawa and the Vietnam War” – a Japanese TV documentary based upon his research – was winner of an award for excellence from Japan’s Association of Commercial Broadcasters. A Japanese-language book based upon his research into Agent Orange on Okinawa is scheduled for publication in Tokyo in 2014. 1 For an account of the discovery of the barrels, see here. 2 Honda’s comments are included in a July 7 interview with Ryukyu Shimpo newspaper available here. 3 See for example Jon Mitchell, “Military Contamination on Okinawa: PCBs and Agent Orange at Kadena Air Base”, The Asia-Pacific Journal, Vol. 12, Issue 12, No. 1, March 24, 2014. Available here. 4 See Jon Mitchell, “Herbicide Stockpile at Kadena Air Base, Okinawa: 1971 U.S. Army report on Agent Orange,” The Asia-Pacific Journal, Vol. 11, Issue 1, No. 5, January 14, 2013. Available here. 5 The Okinawa Defense Bureau report is available from its homepage here. 6 汚染ドラム缶：枯れ葉剤成分 高まる不安 調査と除去要求, Okinawa Times, July 8, 2014. 7 Matthew Burke, “Water fountains at Kadena Air Base disconnected after new testing reveals traces of lead”, Stars and Stripes, May 30, 2014. 8 Jon Mitchell, “Agent Orange at Okinawa’s Futenma Base in 1980s,” The Asia-Pacific Journal, Vol 10, Issue 25, No. 3, June 18, 2012. Available here. 9 For more information, see here.